Learned wordpress to created a science education site anyone can use. Tutoring in chemistry, biology, and physics up to a college level. Can provide reference of clients if needed. The focus of the research is aimed at the developement of ascidians as a model chordate organism for the study of mutations effecting cilia function using the techniques of molecular cloning, misexpression of endongenous genes (GAL4/UAS system), and fluorescent microscopy. Duties included experimental design, calibration and operation of joint simulator machines, cytological imaging, maintenance of cartilage cell cultures, cell viability testing, and determination of signal transduction and protein expression after injury through western blot for the purpose of improving surgical techniques and patient care for recipients of joint surgery. Was unable to complete my masters due to funding issues. 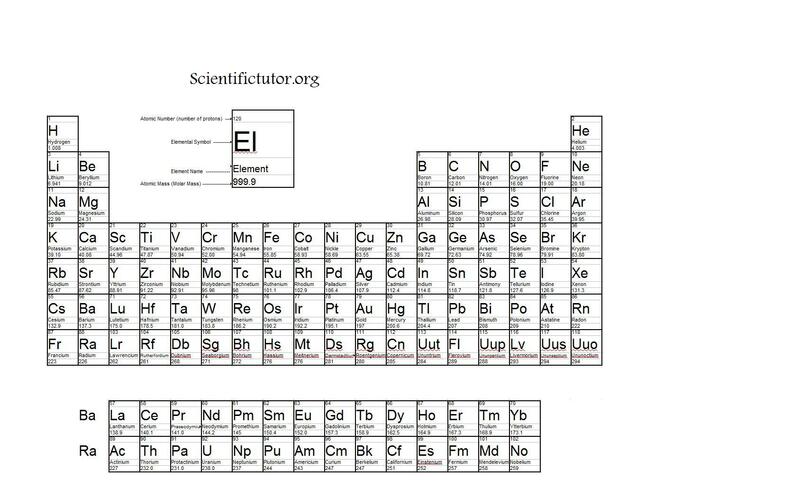 These are answered with information from this periodic table. VIDEO Determining Neutrons from periodic table Examples 1. How do you calculate the radioactive half-life? Radioactive half-life can be used to describe how old something is by measuring how much of a particular isotope is remaining after a certain amount of time. The mathematics of how radioactive decay works can be a little confusing. If you went over the integrated rate law section, then you will know the calculations coming up are called first order equations. If you did not go over this section in you class don’t worry I can explain it here. Radioactive decay actually functions as a probability. That is that no one nucleus of an atom is certain to decay at a certain time point. However, if you take a lot of atoms of one element and one specific isotope and measure how fast all of them decay, you will get a consistent answer. That answer follows what we call a half-life reaction. That means that half of the amount or sample that you start with will always disappear or be broken down over the half-life time. This means you are always cutting your sample in half at every half-life and technically the entire sample can never actually disappear. It is what math students would call an inverse square. There are 2 important formulas for half-life that students have to know. They are written below. In the above formula, we have two time numbers we are looking at and some students can get them confused. The time in the top left box is how long we are measuring with a timing device like a stopwatch or clock. The half-life time in the bottom left box is how long it takes for half the sample you have to break down and become something else. The number of half-lives is telling the person how many times it has undergone a half-life. You can also represent the number of half-lives with the letter n. This is the second way to write the formula I have shown above. In this formula, the n is representing the same thing as in the previous formula. It is the number of half-lives that the sample has undergone. This means that when you find the number of half-lives, you then may be able to solve either formula. The amount at the start is always going to be the larger of the amounts you are given. For example, if a problem has the numbers and units of 50g and 12.5g, the 50g is your amount at start. You may have also guessed that your amount at end is always going to be the smaller number. So the 12.5g would be your amount at end in the same example I just gave. Examples: Solve the half-life reactions below. If a certain isotope has a half-life of 4500 years and has been around for 22500 years, then how many half-lives has it gone through? If we start out with 40g of an isotope, how much will we have after 4 half-lives? If silver-108 has a half-life of 418 years, how long would it take for a sample to go from 8g to 0.0625? VIDEO Half-Life Demonstrated Example 1: If argon-39 has a half-life of 269 years, how many half-lives has it gone through after 1076 years? What information does the problem give you? YOU DO NOT NEED the isotope information (argon-39) EVER with half-life problems. What does the question ask you? Answer: number of half lives = ? Answer: Start with the equation that includes everything you have and need. What can we fill in? Answer: the information that the problem gives you. VIDEO Half-Life Demonstrated Example 2: If we start out with 200g of an isotope, how much will we have after 6 half-lives? Answer: amount at end = ? VIDEO Half-Life Demonstrated Example 3: If a sample of carbon-14 goes from 50g to 1.5625g and its half-life is 5700 years, how long has it been? YOU DO NOT NEED the isotope information (carbon-14) EVER with half-life problems. Answer: Start with the equation that you have more information for. Answer: We want to start getting the n alone, so divide both sides by 50g. THIS IS WHERE LOTS OF STUDENTS GET CONFUSED! To solve for an exponent you must use the NATURAL LOG function on your calculator that usually looks like (ln). What you do is take the natural log of both sides. So that means take the natural log of 0.5 ( = -0.6931 ) and then in a separate calculation take the natural log of 0.03125 ( = -3.4657 ). This turns the problem into a multiplication like below. Divide right side. You have to estimate a little. This means you have 5 half-lives but you are not done yet. Now we move to the second equations both with the information of 5 half-lives and with some of our original information of 5700 years for one half-life. PRACTICE PROBLEMS: Solve the half-life reactions below. If we start out with 80g of an isotope, how much will we have after 3 half-lives? If a certain isotope has a half-life of 1300 years and has been around for 11700 years then how many half-lives has it gone through? How much would be left of 400g of titanium-44 after 441 years, if it had a half-life of 63 years? If silicon-32 has a half-life of 170 years, how long would it take for a sample to go from 12g to 0.1875g? Chem – How Does Radioactive Decay work? Radioactive decay is part of what we have described so far in this lesson as alpha, beta, or gamma radiation or fission. Radioactive decay is just describing how elements break down into other elements. All of radioactive decay is dictated by one fact; that each element has a favored balance between the protons and neutrons in its nucleus. It is kind of like how each game you play has an optimal number of people that you want to play with. Too many people and the field becomes crowed. Too few and play becomes slow. This balance of protons and neutrons in the nucleus is also not the same for every element. For the lighter elements, the balance seems to be best around 1 proton to 1 neutron. For the heavier elements, the balance seems to be best when you have about 1 proton for every 1.5 neutrons. There are a lot of explanations in science of exactly why this happens but most are fairly complex. The way I tend to think about it is a three-pronged approach. 1) The interaction of a proton with other protons. 2) The interaction of a proton with neutrons. 3) The interaction between a neutron with other neutrons. You probably have not given it much thought until now, but what happens when you try to put two protons near each other? Well, what happens when two positive charges are next to each other? They repel from each other. So the protons in the nucleus are trying to get away form the other protons in the nucleus. Then why do the protons all remain in the nucleus? I like to think of the neutrons like a glue material. The purpose of neutrons is to help glue together protons so they don’t go flying out of the nucleus. However, neutrons also interact with neutrons to repel each other. So we have 3 basic forces competing here. 1) Will push apart the nucleus. 2) Will hold together the nucleus. 3) Will push apart the nucleus. A stable nucleus is one that will keep these 3 forces in stable balance. A stable nucleus will also hang around for a long period of time on average. On the other hand, and unstable nucleus will not strike a balance between the 3 forces and therefore only hang around a short time on average. Most people will tell you that the statements I have made above are untrue but it is my simple way of explaining something that is very complex and is still not full understood. What is the nuclear binding energy? Where does the energy of fusion and fission equations come from? Well, so far we have been treating the masses in nuclear equations as whole numbers. However, if you become super accurate at measuring the masses of different isotopes before and after a nuclear reaction, you will start to notice something strange. If you take two light elements and smash them together to make two heavy elements, there is a tiny bit of difference between the light elements and heavy elements. The light elements total mass will have slightly more mass than the single heavy element. This is what books and teachers will call the mass defect. Where did the mass go? The mass turned into energy and that energy was used to help bind together the new heavier nucleus. This is energy is called the nuclear binding energy. The energy was predicted Albert Einstein’s famous equation E = mc2 before it was ever demonstrated to be true. The energy can also some times be released to produce the explosions we see in fusion and fission reactions. Einstein’s equation was truly revolutionary but a lot of people have trouble seeing why. Since it is not something you need to know for any chemistry test, I do not include it in this section but you can click on this link to learn more if you wish. What you will need to know for this class is simply how to use and solve for Albert Einstein’s equation of E = mc2. Let us take a look at it below for explanation. E represents energy usually measured in Joules. The m represents mass, which is usually measured in kilograms. Last, c represents the speed of light, which is a fixed number or what they called a constant at 3.0 * 108 m/s. There are only two variables (E and m) because c will always be the same number. That means you can be given m and asked to solve for E or you could be given E and asked to solve for m. Some of the math in this equation goes back to the section on multiplying and dividing scientific notation. Review that section if you are having problems with the math. Examples: Solve the equations below. Don’t forget that you can always use 3.0 * 108 m/s for your speed of light. If you convert 2.5kg of mass into pure energy, how much energy will you produce? How much mass is need to produce a small explosion of 400 kJ if you were able to able to turn all that mass into energy? In a fusion reaction two atoms of hydrogen each with a mass of 3.34755 * 10-27 kg collide to make a helium of mass 6.69400 * 10-27 kg. What is the nuclear binding energy of a helium nucleus? VIDEO Nuclear Binding Energy Demonstrated Example 1: If you convert 7.3kg of mass into pure energy, how much energy will you produce? Don’t forget that you can always use 3.0 * 108 m/s for your speed of light. VIDEO Nuclear Binding Energy Demonstrated Example 2: How much mass is need to produce a large explosion of 5000 kJ if you were able to able to turn all that mass into energy? Don’t forget that you can always use 3.0 * 108 m/s for your speed of light. VIDEO Nuclear Binding Energy Demonstrated Example 3: In a fusion reaction two atoms of helium each with a mass of 6.69400 * 10-27 kg collide to make a Beryllium of mass 1.3375 * 10-26 kg. What is the nuclear binding energy of a helium nucleus? Don’t forget that you can always use 3.0 * 108 m/s for your speed of light. Since there are two helium atoms in the reaction we need to find a total mass of the both the helium together. Since this is a mass defect problem that means the mass we calculated minus the mass of the beryllium is the mass that is turning into energy. Now we have our mass but we need to solve for our E. Start with the Equation. PRACTICE PROBLEMS: Solve the nuclear binding energy examples below with. Don’t forget that you can always use 3.0 * 108 m/s for your speed of light. If you convert 1 g of mass into pure energy, how much energy will you produce? How much mass is need to produce a heat a small cup of water at 1200 J if you were able to able to turn all that mass into energy? In a fusion reaction two atoms of Beryllium each with a mass 1.3375 * 10-26 kg collide to make an Oxygen atom of mass 2.6742 * 10-26 kg. What is the nuclear binding energy of a helium nucleus? There are two basic ways to go about creating new elements. One is to take lighter elements like Hydrogen and turn them into heavier elements like Carbon and Iron. This lighter to heavier process is called fusion. In fusion, you basically take two lighter elements and smash them together to make heavier elements like taking two pieces of small cookie dough and making a bigger cookie. The most common way for fusion to happen is in a star like our sun. Because of the stars large gravitational force, it can smash these elements together to make heavier ones. Currently, our sun is taking much of its’ hydrogen and smashing it together to make helium. Look at the example below of a nuclear equation that involves fusion. If you want to know more about fusion and how it works in nature click this link. A very common FUSION equation that happens in our sun. The other way to create new elements is to take a heavy element like Uranium and break it into smaller elements like Barium or Iodine. This heavier to lighter is called fission. This is just like taking a large piece of cookie dough and breaking it into two smaller pieces of cookie dough. The most common way for fission to happen is in a nuclear power plant. Fission usually occurs when large elements are bombarded by radiation or small particles. This acts to break up the larger element. Take a look at the example below of a nuclear equation that involves fission. If you want to know more about fission and how it works in nature click this link. A very common FISSION equation that happens in nuclear power plants. What are the different types of nuclear equations (radioactive decay)? Some types of nuclear equations are more commonly seen than others. The most common are the first three types of alpha, beta, and gamma radiation. These can also be known as alpha, beta, and gamma decay. Alpha radiation gets its name from the alpha particle. This particle is just a helium nucleus (represented by He). The reason why it is called an alpha particle and not a helium particle is because people named this type of radiation before they knew what particles were actually involved. The same goes for the other types of radiation. The second common type of radiation, beta radiation, is named for the beta particle. The beta particle is simply an electron (represented as e or B). The third type of common radiation, gamma radiation, is named for the gamma particle. The gamma particle is simply a photon (represented by g). Because the different radiation types involve different particles they also have different penetration characteristics. That is to say some radiation particles can penetrate thicker and denser materials while others cannot. In general, the larger the particle size the worse it is at penetrating. On a scale of particle size, alpha is the biggest, while beta is in the middle, and gamma is the smallest. This means that alpha particles or alpha radiation will not penetrate materials very well. In fact, a few sheets of paper will stop alpha radiation flying at you. Since beta is smaller than alpha, beta will penetrate through a few sheets of paper. However, beta particles will be stopped by a thick piece of wood. Since gamma is the smallest type of particle, it will penetrate thick wood and even some metal. To stop gamma you need a very dense piece of metal like lead. This is why you wear a lead apron when you take an x-ray at the doctors. It stops the intense rays like x-rays or gamma rays. The examples of alpha, beta, and gamma radiation are displayed in the nuclear equations below. Be able to recognize and name them if you see them. Examples: The different types of radiation are shown below. The sections in red determine which types of radiation they are. Everything else but the sections in red can change. PRACTICE PROBLEMS: Give the missing element in the nuclear equations and classify the nuclear equations as alpha, beta, or gamma radiation. Chem – How do you Write Nuclear Equations? How do you write nuclear equations? This section is built off a previous section of atomic notation in the periodic table lesson toward the beginning of the chemistry course. The atomic notation section shows you how each element is displayed. After you know that you can start putting together many of the elemental displays into an equation. The nuclear equations are very similar to regular chemical equations. Lets look at one below and then dissect it. The most important things to notice about the nuclear equations are that they have the same yield (arrow) symbol to separate one side of the equation from the other. You can still call them the reactants and the products side but that terminology is not used very often. The most important things about the nuclear equations are to look at the mass numbers and proton numbers. Notice that if you total up all the mass (top numbers) on one side of the equation it equals the total mass on the other side of the equation. This is always true. The same concept works with the protons. That is if you total up all the protons (bottom numbers) on one side of the equation, then they equal the total protons on the other side of the equation. This is always true. However, there are many addition notations that can throw some people. One of those factors is to see coefficients in nuclear equations like the example below. In the example above, you have to remember that each coefficient multiplies both the mass number and the proton number when you are counting them up. So 2 Li has 6 protons total and a total mass of 14. Nuclear equations also use other symbols that may be unfamiliar to you. See examples below. In the first example we see the n symbol. The n represents a neutron. In the second example we see an e symbol. The e represents an electron. More Examples: Give the missing information from the nuclear equations. PRACTICE PROBLEMS: Give the missing information from the nuclear equations below. NOTE: Many of the nuclear reactions in this lesson are made up. Some or all might not be realistic but they are all a true representation of how nuclear equations work. This lesson is all about the nucleus of an atom and how the different elements came about. Until now we have assumed that you cannot create one element from another. In most laboratories and in every day use, assuming that we cannot create new elements is correct. However, under extreme conditions or circumstances, one element will transform into another. This lesson explains how that can be done and how chemistry teachers and books will display it. What should you know before attempting this lesson? —> How Do You Write Nuclear Equations? —> How does Radioactive Decay Work? How do you determine an oxidation versus a reduction? 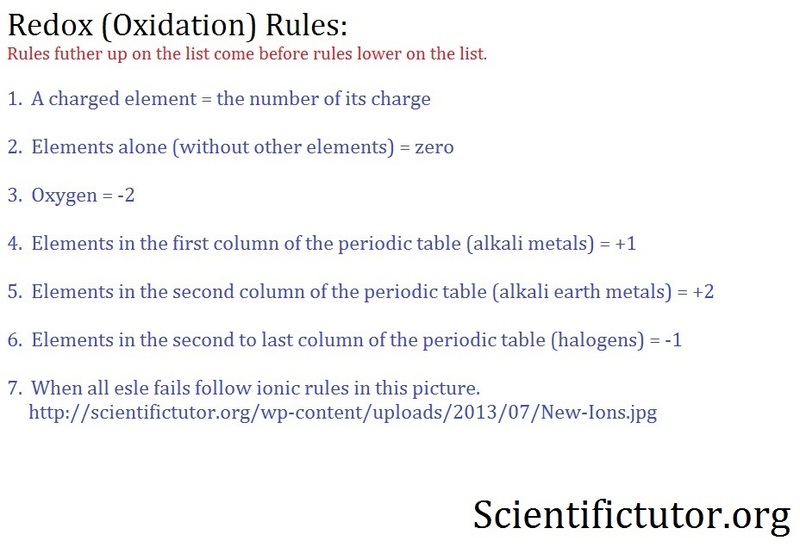 The next step in this chapter is to now use these redox rules and apply them to chemical equations. You still treat each compound, molecule, or element you come across in the same way as the redox rules in the previous section. However, you will start to notice that some elements will change redox numbers as they go from the reactants side to the products side. This change in redox number is what you are looking for. IF AND ELEMENT LOSES ELECTRONS IT HAS BEEN OXIDIZED OR UNDERWENT OXIDATION. This means it will increase its redox number. Another way to state that is the element increases in charge (becomes more positive or closer to a positive charge). IF AN ELEMENT GAINS ELECTRONS IT HAS BEEN REDUCED OR UNDERWENT REDUCTION. This means it will decrease its redox number. Another way to state that is the element decreases in charge (becomes more negative or closer to a negative). The picture below summarizes this text above. What is the purpose of assigning redox numbers to the elements in a chemical equation? The purpose of assigning redox numbers to all elements in chemical equations is to determine which elements are undergoing oxidation and which elements are undergoing reduction. Another handy tip to remember these is the word OIL RIG. It stands for Oxidation is a Loss of electrons and Reduction is a Gain of electrons. Answer: Na is undergoing OXIDATION. Cr is undergoing REDUCTION. Answer: Carbon is undergoing OXIDATION. Oxygen is undergoing REDUCTION. Step 1: How do I start? Answer: Give all the elements their redox numbers on each side of the equation. Step 2: What elements are changing in redox number as they go from reactants to products? Step 3: Which one is undergoing oxidation? Step 4: Which one is undergoing oxidation? COMPLETE ANSWER: Oxygen is undergoing OXIDATION. Carbon is undergoing REDUCTION. Step 3: Which is undergoing oxidation? Step 4: Which is undergoing reduction? COMPLETE ANSWER: Copper is undergoing OXIDATION. Iron is undergoing REDUCTION. What are redox or oxidation numbers? 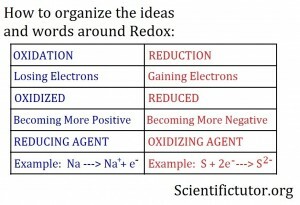 Redox comes from the combination of the word reduction and oxidation. The first thing we have to learn in this lesson is what they call the redox numbers. They are numbers that are assigned, much like ions. In fact, they mean the same thing as the ion charges but they are assigned to different elements in a slightly different way. So if I say an element has a redox number of +2, then that means the element is positively charged and is therefore missing 2 electrons. 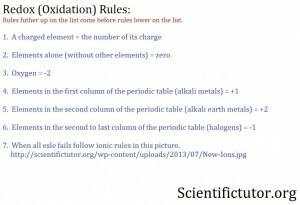 Look at the picture below for the rules to assign redox number to different elements in different compounds or molecules. The order that I listed these rules REALLY DOES MATTER. The reason why is if you have a conflict between the rules you automatically go with the rule that is higher (or more toward the beginning) on the list. The only way to understand these rules is to test them out and see what they really mean. These rules are meant to be used if you are given some kind of compound, molecule, or element. Just like the when we were figuring out ionic compounds before, the compound should add up to zero unless the entire compound or element is charged. Make sure you open up a separate web page with my rules in the center. This way you can look back at the redox rules as you are looking through the example problems. How do I use redox or oxidation numbers? I also organize my redox numbers as I apply the rules to each compound I come across. Above each element in the compound I put the INDIVIDUAL redox number (the redox number for only one of that element). Below each element in the compound I put the TOTAL redox number (individual redox number multiplied by amount of that element). To the RIGHT of the total redox numbers I put what they should all add up to. This is shown in the redox number table below. If you don’t understand it right away try looking at the examples that follow. VIDEO Redox Numbers Demonstrated Example 1: What are the redox numbers for each element in the molecule below? Use the redox rules. Is it a compound or individual element? What do I fill in first in the table? Answer: The entire compound adds up to zero because it does not show a charge. What is the first of my rules that apply? How much oxygen do you have? What do all the hydrogen have to add up to? What is the charge on each hydrogen? What is the redox number for each element? VIDEO Redox Numbers Demonstrated Example 2: What are the redox numbers for each element in the molecule below? Use the redox rules. How much oxygen do we have? What is the next rule that applies? How much hydrogen do we have? What do all the sulfur have to add up to? What is the charge on each sulfur? What are the redox numbers for each element? VIDEO Redox Numbers Demonstrated Example 3: What are the redox numbers for each element in the molecule below? Use the redox rules. How much sodium do we have? What is the total charge of all the Cl? What is the charge of each Cl? Notice the last element in the compound that I assign a charge to no longer has to follow my rules. The last element I assign a charge to simply has to be a charge or redox number that makes the whole compound add up to zero or whatever the total charge of the compound is. VIDEO Redox Numbers Demonstrated Example 4: What are the redox numbers for each element in the molecule below? Use the redox rules. Answer: The entire compound adds up to -2. What is the first rule that we apply? What is the total charge of all the S? VIDEO Redox Numbers Demonstrated Example 5: What are the redox numbers for each element in the molecule below? Use the redox rules. What is the first rule that applies? What is the charge on Fe? VIDEO Redox Numbers Demonstrated Example 6: What are the redox numbers for each element in the molecule below? Use the redox rules. What is the first rule that we can apply? What is the charge of Br? PRACTICE PROBLEMS: Give the redox numbers for each element in the compound. 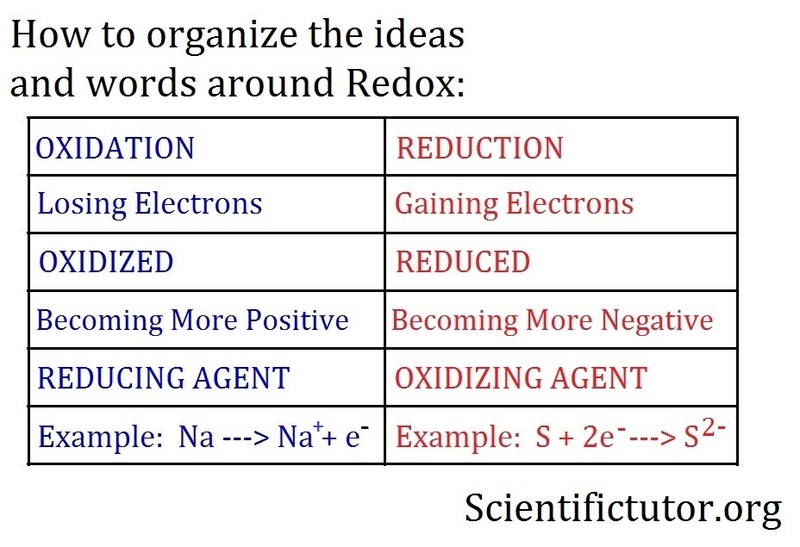 —> Balancing Redox (Oxidation / Reduction) Reactions. How do you use Ka or Kb in ICE or RICE tables? ICE tables for Ka and Kb work the same as they do for any other equilibrium. They can, however, be confusing when you have more than one ionization with a polyprotonic acid. I will show one example a of a base with a single ionization and then one example of an acid with multiple ionizations. Use assumption where you can. VIDEO Solving Ka, Kb ICE Tables Demonstrated Example 1: If the initial concentration of the base NH3 was 0.7M, and the Kb is 4.3 * 10-5. What would be the concentration of OH– be at equilibrium? First step form the chemical equation. Then set up the ICE table and fill in the information from the problem. Next make an X value representing the change in concentration when it shifts to the equilibrium. Then add the initial and change together to get the equilibrium concentration. Now construct the equilibrium equation from the equilibrium values you have. We can make an assumption to get rid of the -x in [ 0.7M – x ]. So it becomes [ 0.7 ]. I have also removed the units to make visualization easier. Cross out the 0.7 on the left side. Take the square (2) root of both sides. VIDEO Solving Ka, Kb ICE Tables Demonstrated Example 2 (with pH): If the initial concentration of the base NH3 was 1.5M, and the Kb is 4.3 * 10-5. What would be the pOH be at equilibrium? Use the pH formulas when you need them. Then set up the ICE table and fill in the information from the problem (I only included aqueous because liquids don’t count for equilibrium). Now construct the equilibrium equation from the equilibrium values you have. From the question above your Kb is 4.3 * 10-5. We can make an assumption to get rid of the -x in [ 1.5M – x ]. So it becomes [ 1.5 ]. I have also removed the units to make visualization easier. Cross out the 1.5 on the left side. Now we know our [OH-] = 8.03 * 10-3. If we use our pH formulas then we can convert that to a pOH. VIDEO Solving Ka, Kb ICE Tables Demonstrated Example 3 (polyprotonic acid): If the initial concentration of H2S was 1.3M, and the Ka1 is 3.5 * 10-4 and the Ka2 is 7.9 * 10-9. What would be the concentration of H+ be at equilibrium? From the chemical equation for the first ionization of H2S. We can make an assumption to get rid of the -x in [ 1.3M – x ]. So it becomes [ 1.3 ]. I have also removed the units to make visualization easier. Cross out the 1.3 on the left side. The [ H+ ] from the first ionization is 2.13 * 10-2M. Because the [ HS– ] is also 2.13 * 10-2M, you can then go on to use this as the new initial concentration for your next equilibrium equation. I will show you the continuation of this problem below. However, as you will notice when I finish, most of the time only the first ionization of an acid contributes significantly to the [ H+ ]. That is to say, the first ionization contributes about 99% or more of the value for your overall or final [ H+ ]. So whenever I have to do equilibrium problems with polyprotonic acids in them I ONLY DO THE FIRST IONIZATION AND THEN GIVE THAT AS MY ANSWER. So the answer I would give for this problem is 2.13 * 10-2M. Form the second chemical equation for the ionization of HS–. We can make an assumption to get rid of the -x in [ 2.13 * 10-2 – x ]. So it becomes [ 2.13 * 10-2 ]. I have also removed the units to make visualization easier. Cross out the 2.13 * 10-2 on the left side. Bring together the concentrations from the first ionization and the second ionization. The second ionization adds less than 1% difference so if I have 3 sig figs it does not even count. PRACTICE PROBLEMS: Solve the Ka or Kb equilibrium ICE table problems below. Use your pH formulas if you need them. If the initial concentration of the base F– was 12M, and the Kb is 9.4 * 10-6. What would be the concentration of OH– be at equilibrium? If the initial concentration of the acid NH4+ was 4.2M, and the Kb is 1.6 * 10-11. What would be the concentration of H+ be at equilibrium? If the initial concentration of the BrO2– was 0.8M in water, and the Kb is 2.3 * 10-5. What would be the pH be at equilibrium? Carbonic acid is created with an initial concentration of 3M. If the carbonic acid has a Ka1 of 9.8 * 10-5 and a Ka2 of 6.1 * 10-12. What would be the pOH be at equilibrium? H3PO4 was put into water at a concentration of 0.098M. The Ka1 is 1.3 * 10-3, the Ka2 is 7.2 * 10-6 and the Ka3 is 5.6 * 10-9. What would be the concentration of OH- be at equilibrium? What assumptions can you make with ICE or RICE tables? When you have specific K values for equilibrium equations and ice tables most teachers and tests will allow you to make mathematically assumptions about them. The critical K values to look for are K values that are lower than 10-3 or higher than 103. This allows you to ignore the change values on one side of the ICE table when you are accounting for them in an equilibrium equation. You can do this because the values of change in those concentrations will be so small that it will not make a significant mathematical difference to the overall problem. VIDEO Solving ICE Tables Demonstrated Example 3: If the initial concentration of H2O was 3M, and the equilibrium constant was 2.3 * 10-3. What would be the concentration of H2 be at equilibrium? Use the balanced chemical equation below. First set up the ICE table and fill in the information from the problem. Next, make an X value representing the change in concentration when it shifts to the equilibrium. Here is where one assumption comes in. It shifts to the right because the concentration values are zero on the right hand side. Here is where another assumption comes in. Since our K is 10-3 we can assume that the -2x from the bottom of the equation does not matter and therefore we can remove it from the equation. The problem now becomes much easier to solve for. Our goal now is to solve for x. Start by applying the exponents. Multiply both sides by 9. Cross out the 9 on the left side and multiply the values on the right side. Cross out the 4 on the left side and divide the 4 on the right side. Take the cube (3) root of both sides. Now that we found x we can solve for what H2 will be at equilibrium, which is 2x. You can check this answer by putting the concentrations back into the original equation and then finding out what K value you get with them. The difference in the K value you come up with is about 3 times but at the levels of 10-3 this is pretty insignificant. VIDEO Solving ICE Tables Demonstrated Example 4: If the initial concentration of HCl was 0.5M, and the equilibrium constant was 6.3 * 104. What would be the concentration of Cl2 be at equilibrium? Use the balanced chemical equation below. Next, make an X value representing the change in concentration when it shifts to the equilibrium. Here is where one assumption comes in. It shifts to the left because the concentration values are zero on the right hand side. Here is where another assumption comes in. Since our K is 104 we can assume that the -2x from the top of the equation does not matter and therefore we can remove it from the equation. Multiply both sides by x2. Cross out the x2 on the left side. Divide both sides by 6.3 * 104. Cross out 6.3 * 104 on the right side. PRACTICE PROBLEMS: Solve the equilibrium ICE table problems below. If the initial concentration of HBr was 1.5M, and the equilibrium constant was 3.2 * 10-4. What would be the concentration of H2 be at equilibrium? Use the balanced chemical equation below. If the initial concentration of BaCl2 was 2M, and the equilibrium constant was 4.6 * 105. What would be the concentration of HCl be at equilibrium? Use the balanced chemical equation below. If the initial concentration of HBr was 0.035M, and the equilibrium constant was 8.7 * 10-8. What would be the concentration of O2 be at equilibrium? Use the balanced chemical equation below. How do you use the reaction quotient? Now that we know how to calculate the reaction quotient (Q) we can talk about what it means and how to use it. Most books explain it in terms of comparing the reaction quotient (Q) to the equilibrium constant (K). If Q is LARGER than K then the reaction will proceed to the LEFT. If Q is SMALLER than K then the reaction will proceed to the RIGHT. Okay what the heck does that mean? It means if Q is LARGER than K then we have too many products to be at equilibrium. That means we have to take some of those products and turn them into reactants. What if Q is SMALLER than K? Then we have too many reactants to be at equilibrium and we need to take some of those reactants and turn them into products. Lets say I have a party at my house. I invite 50 people because the backyard can hold 20 people and the inside of my house can hold 30 people. What is my equilibrium constant? As people start to arrive at the party they enter through the front door and start inside that house. 15 minutes after the party has started 25 people are inside the house and 5 people are in the backyard. What is the reaction quotient (Q) at that moment? Is the Q LARGER or SMALLER than the K? Answer: That there are too many people inside the house (on the right side of the equation). This will cause people to start moving outside (cause people to start moving to the left side of the equation). After more time has passed more people start to move into the backyard and more people show up to the party. 2 hours after the party starts 10 people are inside the house and 40 people are in the backyard. What is the reaction quotient (Q) at that moment? Answer: That there are too many people in the backyard (on the left side of the equation). This will cause people to start moving inside the house (to the right side of the equation). All we have to do now is think of molecules like we do the people in the example above. If the chemical equation below has the equilibrium constant of 2.5 * 10-4. What will be the reaction quotient when the concentration of H2O is 25 M, the concentration of H2 is 0.3M, and the concentration of O2 is 0.5 M? Which side will have too high of a concentration REACTANTS or PRODUCTS? Which way will the reaction need to shift to return to the equilibrium? How does the Q compare to the K? Which side has too much stuff (too high a concentration)? Which way will the reaction need to shift to return to the equilibrium? PRACTICE PROBLEMS: Which way the do reactions below need to shift to return to equilibrium? If the chemical equation below has the equilibrium constant of 3.2 * 10-2. What will be the reaction quotient when the concentration of Fe3+ is 0.4 M and the concentration of CO32- is 0.8 M? Which way will the reaction need to shift to return to the equilibrium? If the chemical equation below has the equilibrium constant of 15. What will be the reaction quotient when the concentration of H2SO4 is 4M, the concentration of H2 is 0.2M, and the concentration of O2 is 0.6M? Which way will the reaction need to shift to return to the equilibrium? If the chemical equation below has the equilibrium constant of 15. What will be the reaction quotient when the concentration of N2O3 is 0.6M, the concentration of N2 is 10M, and the concentration of O2 is 3M? Which way will the reaction need to shift to return to the equilibrium? What is the reaction quotient? The reaction quotient is often explained in a very confusing manor. However, it is something quite simple. The reaction quotient allows you to compare the current concentrations or pressures of the reactants and products to the eventual equilibrium they will achieve. This gives you a hint as to which way or how the equilibrium will shift. Very similar to Le Chatelier’s Principle. How do we figure out the reaction quotient? The same way we figure out the equilibrium. The reaction quotient is represented by a Q. Notice it is the exact same formula as the equilibrium. What is the reaction quotient for a chemical equation we know and have worked with before? Again, it is the exact same as the equilibrium formula. So what is the difference between the equilibrium constant (K) and the reaction quotient (Q)? The reaction quotient is usually used before the chemical reaction has achieved equilibrium. Another way to say that is the reaction quotient is usually used before the concentrations of all the chemicals have stabilized. Examples: What is the reaction quotient (Q) for the problems below? Given that the chemical equation above has not yet achieved equilibrium, what is the reaction quotient if the concentration of H2O is 0.3M, the concentration of H2 is 5M, and the concentration of O2 is 10M. After the chemical equation above reaches equilibrium additional NaBr is added. Directed after the NaBr is added, the concentration of MgBr2 is 0.2M, the concentration of NaI is 0.4M, the concentration of MgI2 is 0.5M, and the concentration of NaBr is3M. What is the reaction quotient? What is the reaction quotient expression for this chemical formula? How do we fill in the concentrations? PRACTICE PROBLEMS: What is the reaction quotient (Q) for the problems below? Given that the chemical equation above has not yet achieved equilibrium, what is the reaction quotient if the concentration of CaCl2 is 12M, the concentration of Al2(SO3)3 is 2M, the concentration of CaSO3 is 3M, and the concentration of AlCl3 is 1M. After the chemical equation above reaches equilibrium additional S is added to the reaction mixture. Directed after the S is added, the concentration of H2SO4 is 0.4M, the concentration of H2 is 0.1M, the concentration of S is 0.03M, and the concentration of O2 is 0.8M. What is the reaction quotient? When you are given multiple Ka or Kb values (like Ka1, Ka2, Ka3), you can also combine them together into an overall Ka or Kb by multiplying them together. The equations below display what I mean. If Mg(OH)2 has a Kb1 of 0.3 and a Kb2 of 4.5 * 10-3 what is the over all Kb value? If H3PO4 has a Ka1 of 2.8 * 10-3 and a Ka2 of 7.1 * 10-6. Then what would be the Ka3 if the overall Ka is 7.75 * 10-17? If Al(OH)3 has a Kb1 of 0.04 and a Kb2 of 5.1 * 10-4 what is the over all Kb value? If H2SO4 has a Ka1 of 15 and a Ka2 of 2.0 * 10-2. Then what is the over all Ka value? If H3PO3 has Ka2 of 4.7 * 10-5 and a Ka3 of 2.3 * 10-8. Then what would be the Ka1 if the overall Ka is 5.5 * 10-16? If Be(OH)2 has a Kb1 of 3.6 * 10-4 and an overall Kb of 8.2 * 10-12 what would be the Kb2? It turns out that Ka and Kb are related to one another in a formula. This formula allows you to convert from Ka to Kb and vise versa. The formula is shown below. The great thing about this formula is it also allows you to predict whether something is an acid or a base. The way to figure whether something is an acid or base just by its Ka or Kb value is to compare it to the equilibrium constant for water like in the equation below. If the Ka turns about to be a larger number than the Kb then the chemical will be an acid. If the Kb turns about to be a larger number than the Ka then the chemical will be a base. If Ka is larger than 1.0 * 10-7 then the chemical is an acid. If Kb is larger than 1.0 * 10-7 then the chemical is an base. Examples: Temperature of all examples is 25 C.
Give the Kb and tell whether the chemical is an acid or base if it has a Ka of 2.4 * 10-6. Give the Ka and tell whether the chemical is an acid or base if it has a Kb of 3.5 * 10-4. Give the Kb and tell whether the chemical is an acid or base if it has a Ka of 4.3 * 10-9. Give the Ka and tell whether the chemical is an acid or base if it has a Kb of 8.9 * 10-11. PRACTICE PROBLEMS: Temperature of all problems is 25 C.
Give the Kb and tell whether the chemical is an acid or base if it has a Ka of 7.2 * 10-9. Give the Ka and tell whether the chemical is an acid or base if it has a Kb of 4.2 * 10-12. Give the Kb and tell whether the chemical is an acid or base if it has a Ka of 3.4 * 10-3. Give the Ka and tell whether the chemical is an acid or base if it has a Kb of 5.6 * 10-7. What if acids or bases have more than one ionization? More than one Ka or Kb? Create the chemical equations and the Ka equilibrium equations for each ionization of the acid H2SO3. Create the chemical equations and the Kb equilibrium equations for each ionization of the base Be(OH)2. VIDEO Setting up Polyionization Ka or Kb Equations Demonstrated Example 1: Create the chemical equations and the Kb equilibrium equations for each ionization of the base Se2-. What is in the reactants of the first chemical equation we need to create? Se2- is acting as an acid or base? What does that mean it does? Answer: It is acting as a base and therefore it grabs an H+ from the H2O to become HSe–. What is the equilibrium equation for that chemical equation? How do you start the next chemical equation? Answer: Use the product of the last chemical equation that had Se in it and add water. HSe– is acting as an acid or base? What does that mean it does? Answer: It is acting as a base and therefore it grabs an H+ from the H2O to become H2Se. One thing to keep in mind is with the vast majority of the time the first ionization (Ka1 or Kb1) is the only significant contributor to the equilibrium concentration. So, in our above example, most of the OH– concentration comes from the creation of the HSe– ion. This is a handy trick if you ever have to calculate the concentration of H+ or OH– in an acid or base that has more than one ionization state. Really you only have to calculate the first concentration of H+ or OH–because the second and third concentrations are so small they don’t even matter. PRACTICE PROBLEMS: Create the chemical equations and the equilibrium equations from the information below. Create the chemical equations and the Kb equilibrium equations for each ionization of the base CO32-. Create the chemical equations and the Ka equilibrium equations for each ionization of the acid H3PO4. Ka and Kb are the representations of the equilibrium constant for acid or base reactions. Again, there is nothing different in the math or equation set up for Ka or Kb. All equilibrium acid or based chemical equations are set up in one direction like the examples below; where the acid or base together is shown on the reactants side and the ions of the acid or base is shown on the products side. This will NEVER change for Ka or Kb equilibrium equations. The generic equations for Ka and Kb look like the ones below. They are useful for trying to form equations when the you get complicated acid and base questions: HA represents the acid, A- represents the negative ion that the acid produces, BOH represents the base, B+ represents the positive ion that the base produces. Most acid or base equilibria are pretty straightforward to follow and match up the generic formulas. Examples: Create the equilibrium equation from the chemical equations below. However, some acid base equilibria are very confusing. This is because you some times have to imagine the equation with liquid H2O to make sense. You have to remember that water should always be present in these equations and since H2O is a liquid it does not count for the equilibrium equation. If this part confuses you, then try going back to the conjugate acid base pairs section in the solutions lesson. Examples: Provide the Ka or Kb equation for the chemical equations below. You will be expected to predict whether a compound or ion in the reactants acts as an acid or base for future in class questions so you want to get good at it now. The above examples lead us to some clues about the more complex and confusing acid and base equations. First of all, if you have a single positive ion in the reactants, then most likely it is going to act as an acid. Second, if you have a single negative ion in the reactants most likely it is going to act as a base. You can always assume these two things unless you are told otherwise. This allows you to write Ka and Kb equations with minimal information. VIDEO Setting up Ka or Kb Equations Demonstrated Example 1: Give the Ka or Kb formula if nitrate ions are added to water. How do you start the chemical equation? Is nitrate an acid or base? Answer: It is a base because it is a negative ion. How do you finish the chemical formula? What is the equilibrium equation? PRACTICE PROBLEMS: Set up the Ka or Kb equation given the chemical equation below. If carbonate ions are put in water. How do you relate volume and pressure to Le Chatelier’s Principle? The next hurdle we have to overcome is explaining pressure and volume. Remember we are not going to think about them in the same way as concentration and temperature. Also when we talk about pressure and volume we will not say that we increase the pressure or volume of the reactants side or the products side. This is chemical reaction, both the reactants and products, are in one container. Whatever we do to the container we do to both sides of the chemical equation. For pressure and volume the focus will be on what the total moles are present on each side of the chemical equation. In my example, on the left side of the chemical equation we have 1 mole of N2 and 3 moles of H2. Notice I just took the numbers of the coefficients and used them for the number of my moles. So if I have 1 mole and 3 moles that adds up to a total of 4 moles on the reactants side. Notice I do not care exactly what chemical each of the moles are. I am treating all moles as the same here. In my example, on the right side of the chemical equation I have 2 moles of NH3. So I have 2 moles total on the products side. Moles are no different than any other object or group. If I were to say to you that I had boxes of all the same size and shape, and then I asked you which one takes up more space, 4 boxes or 2 boxes? You would say 4 boxes of course. So if I ask you which one takes up more space 4 moles or 2 moles? You would say 4 moles of course. Therefore, in my example, the reactants side takes up more space. Remember we are treating all moles as the same regardless of what chemical they come from. So now we can see that it is all an issue of space. Lets try to talk about volume first since it is a little easier than pressure. If we increase the volume of the container, in my example above, then we are going to allow for more space. If we allow for more space the equilibrium will cause a shift toward the reactants (left), because that side takes up more space. If we decrease the volume of the chemical equation then the equilibrium will cause a shift toward the products (right) because the products take up less space. Remember that the states of solids and liquids don’t count for anything having to do with an equilibrium. VIDEO explaining volume for Le Chatelier’s Principle. Examples: Which way will the equilibrium shift when we change the volume as mentioned? Just like volume pressure is all about the space that the reactants versus products take up. However, just like in the gas law lesson pressure is inverse (reverse) to the relationship of volume. That means pressure does the opposite of what volume does. I like to think of pressure as a squeeze. If you imagine a balloon between your hands, increasing the pressure on that balloon would be to try to squeeze your hands together. What happens to the space in that balloon? It goes down right? So if we increase the pressure we decrease the volume. Likewise, if I start pulling my hands apart from the now squished balloon I decrease the pressure. What happens to the space? The space increases right? So if we decrease the pressure we increase the volume. Let us take a look at my example problem below. Which side has more moles total? The left side (1 + 3). Which side has less moles total? The right side (2). So if I increase the pressure on the container that this reaction is in, the equilibrium shifts to the right because the space in the container is now smaller. However, if I decrease the pressure on the container that this reaction is in, the equilibrium shifts to the left because the space in the container is now more or larger. Examples: Which way will the equilibrium shift when we change the pressure as mentioned? PRACTICE PROBLEMS: Which way will the equilibrium shift when we change the volume or pressure as mentioned? How do you relate temperature or energy to Le Chatelier’s Principle? If we talk about Le Chatelier’s Principle in terms of temperature changes or energy it works much the same as concentration. I will use the same chemical equation example above to explain. The part you want to focus on for temperature or energy changes is the part in my example that says 200kJ. In other examples they can present this part to make it appear different. They can talk about calories instead of joules or say the equation is endothermic or exothermic or use the representation for Δ H. For the example I have above the chemical equation example is endothermic and the Δ H is positive. In my example above, if we increase the temperature we increase energy available. Since energy is on the left side of the chemical equation in this case, we will shift toward the products (right). Just like concentration if you add or increase one side the shift will be away from that side. On the other hand if we decrease the temperature we decrease the energy available. Since energy is on the left side of the chemical equation in this case, we will shift toward the reactants (left). Again just like the concentration if you take away from one side it will shift toward that side. VIDEO explaining temperature for Le Chatelier’s Principle. Examples: A) Which way will the equilibrium shift when we increase the temperature? B) Which way will the equilibrium shift when we decrease the temperature? Examples: Which way will the equilibrium shift when we change the temperature or energy as mentioned? PRACTICE PROBLEMS: Which way will the equilibrium shift when we change the temperature or energy as mentioned? How do you convert between Kc and Kp? Another problem you might come across is how to convert between Kp and Kc. That is to say how to convert between the equilibrium constant from pressure units and the equilibrium constant from concentration units. The formula is below. R is our old friend the gas constant from the Ideal gas law section . R = 0.0821 when using atm as pressure units. T is temperature in Kelvin. Δ n is the change in moles. This the exponent of R and T multiplied together. If you need to know how to calculate Δ n then go back to the section on Calculating Δ n (delta n). VIDEO Converting Between Kc and Kp Demonstrated Example 1: If the Kc for the chemical equation below is 0.5 at a temperature of 300K, then what is the Kp? What is the Δ n for this chemical equation? Set up the math equation. Put in all the values (numbers). Multiply what is in the parenthesis. Distribute the exponent inside the parenthesis. VIDEO Converting Between Kc and Kp Demonstrated Example 2: If the Kp for the chemical equation below is 8.7 * 10-3 at a temperature of 280K, then what is the Kc? Cancel out the right side. PRACTICE PROBLEMS: Solve the question below involving Kp and Kc. If the Kc for the chemical equation below is 25 at a temperature of 400K, then what is the Kp? If the Kc for the chemical equation below is 6.9 * 10-4 at a temperature of 250K, then what is the Kp? If the Kp for the chemical equation below is 5.7 * 10-2 at a temperature of 273K, then what is the Kc? If the Kp for the chemical equation below is 3.2 * 104 at a temperature of 120C, then what is the Kc? What is the relationship between different equilibrium constants? VIDEO Explanation and Example Problems for the Relationship Between Equilibrium Constants. Within the same chemical equation, questions can be asked about what happens to the equilibrium constant if we change something to that equation. There are two classic examples that pretty well illustrate the point of how it works. The first is what happens when you multiply the chemical equation by a number like 2. Another way to say that is we double all of the coefficients in the chemical equation. If that happens then the equilibrium constant (K value) is taken to the second power (K2). The second classic example is what happens when we flip the chemical equation over (reactants become products and products become reactants). In that case the equilibrium constant (K value) becomes 1 divided by K…(1/K). From there you can mix and match any combination of multiplying or flipping chemical equation over (reversing) to create problems of how K would be different. NOTE: The concept we just talked about above is different than changing the concentrations of a chemical equation. If you change the concentrations of a chemical equation by doubling all of them then you will double the equilibrium constant. If you change the concentrations of a chemical equation by dividing all of them by 2 then you will half the equilibrium constant. Example 1: Solve for the new equilibrium constant given the changing conditions. If the equilibrium constant for the chemical equation below is K = 3M2. Then what is the equilibrium constant for the next chemical equation at the same temperature? Example 2: Solve for the new equilibrium constant given the changing conditions. PRACTICE PROBLEMS: Solve for how the equilibrium constant changes when the reaction changes. How do you use concentration values in equilibrium equations? What is the equilibrium constant Kc? Now that we are done writing equilibrium equations we can start using them with the molar concentration numbers and determine what numbers or values we have. If a book or teacher mentions an equilibrium problem where you have molar concentrations (Molarity) then they will sometimes call the equilibrium constant Kc (or Keq). C is refering to the molar concentration. The main point of this section is to take the Molarity or K numbers you get from a question and put them into the equilibrium equation which you learned how to form in the previous sections……… Then you solve for whichever unknown you are left with. Example: Given the balanced chemical equation below if the concentration of H2SO4 is 4M, H2 is 1M, and O2 is 2M at equilibrium, then what is the equilibrium constant K? VIDEO Solving Equilibrium Equations (Kc) Demonstrated Example 1: Given the balanced chemical equation below. If the concentration at equilibrium of MgBr2 is 3M, NaI is 4M, MgI2 is 6M and NaBr is 2M at equilibrium. What is the the equilibrium constant K? Replace the chemicals with their corresponding concentrations (numbers). Calculate in steps. First apply the exponents from above. Then divide for the complete answer. Some questions don’t ask to solve for K but ask you instead to solve for one of the concentrations. Look at the next example to show you how to deal with those. VIDEO Solving Equilibrium Equations (Kc) Demonstrated Example 2: Given the balanced chemical equation below. If the concentration at equilibrium of Fe3+ is 3M and Fe2(CO3)3 is 2M. What is the concentration of CO32- if the equilibrium constant is 0.5 M-5? Replace the chemicals and equilibrium constant with their corresponding concentrations (numbers). Calculate starting with applying the exponents from above. Rotate the units of Molarity to the top by making the exponent positive on top. PRACTICE PROBLEMS: Give the missing equilibrium constant (K) or concentration below. What is the equilibrium constant of the equation below at equilibrium when the concentration of C4 is 4M, O2 is 0.5, and CO2 is 2M at equilibrium? What is the concentration of O2 from the equation below if at equilibrium when the concentration of OF2 is 0.5M, NH3 is 0.25M, N2F4 is 10M, and H2 is 8M at equilibrium when the equilibrium constant is 6 * 103 M? What is the equilibrium constant of the equation below if at equilibrium the concentration of Ag+ is 2M, Ca3(PO4)2 is 4M, Ca2+ is 0.03M, and Ag3PO4 is 0.05M at equilibrium? What is the concentration of H2O from the equation below if at equilibrium the H2 is 0.02M and the O2 is 0.008M and the equilibrium constant is 0.015M? How do you form an equilibrium equation from a chemical equation? Now let us see how we apply this equilibrium equation to a chemical equation. It is usually best to see examples first and explain after. Group 1 Examples: Set up the equation for the equilibrium constant. VIDEO Setting up the Equation for the Equilibrium Constant Examples 1. Lets analyze these group 1 examples above. So just like we talked about before, the products of the chemical equation become the top (numerator) of the equilibrium equation. The reactants of the chemical equation become the bottom (denominator) of the equilibrium equation. However, something new appears. What are the exponents (powers) that we see in the equilibrium equation? Where do they come from? Look at the first chemical equation in the example. What is the coefficient of NH3(g)? What is the exponent of NH3 in the equilibrium equation? Notice they are the same. That is because the coefficient from the chemical equation becomes the exponent in the equilibrium equation. Note if the coefficient is 1 then no exponent is shown in the equation. That is because anything to the first power is just itself. How do the states of matter affect the equilibrium equation? Unfortunately, there is one more possible trick that teachers or a test can throw at you. The equilibrium equation not only depends on the chemical equation but also the states of matter of each molecule in the chemical equation. For all things having to do with equilibrium only gas and aqueous count. Solids and liquids do not count for anything having to do with equilibrium. This link explains why solids and liquids don’t count. How does it work in the equilibrium equation? It means those things that are solid or liquids are completely removed from the equation. Notice all examples I have used so far have only had gases in them. The examples below have solids or liquids in them that are eliminated from the equilibrium equation. Group 2 Examples: Set up the equation for the equilibrium constant. VIDEO Setting up the Equation for the Equilibrium Constant Examples 2. VIDEO Setting up Equilibrium Equations Demonstrated Example 1: What does the equation for the equilibrium constant look like? What is the coefficient and therefore exponent of CO2? What is the coefficient and therefore exponent of H2O? What does the top (numerator) of the equation look like? What is the coefficient and therefore exponent of CH4? What is the coefficient and therefore exponent of O2? What does the bottom (denominator) of the equation look like? What does the entire equilibrium equation look like? PRACTICE PROBLEMS: What does the equation for the equilibrium constant look like? How can you tell if products or reactants are favored in equilibrium? Sometimes questions are asked about what the equilibrium constant, K, tells you about the equation. The answer that they are looking for is either K tells you that the products are favored or the reactants are favored. If the products are favored then K will be a number larger than 1. Another way to say it is that the numerator will be large or the denominator will be small. If the reactants are favored then K will be a number smaller than 1. Another way to say it is that the numerator will be small or the denominator will be large. One way I like to imagine and understand this concept of what the number K means is to try to fill in numbers in a ratio or fraction that would equal K. For example, if K is 3 then a fraction that could represent that is if the top of the fraction was 6 and the bottom was 2. If the top (numerator) represents the products and the bottom (denominator) represents the reactants then the products are are larger number so the products are favored. Examples: From the equilibrium constant K tell whether the reactants or products are favored. VIDEO Products or Reactants Favored Examples 1 . PRACTICE PROBLEMS: From the equilibrium constant K tell whether the reactants or products are favored. This is one of the most confusing concepts and chapters in chemistry. The reason is not many people tend to think of an equilibrium in their lives. An equilibria or an equilibrium is creating a balance. This does not have to be an equal balance. Here is example of a non-chemical equilibrium. You strike a balance in your every day life. The balance is between work, sleep, and school. Not everyone creates a perfectly equal balance. That is, not everyone works 8 hours, sleeps 8 hours, and goes to school 8 hours a day. Some work 4 hours, sleep 7 hours, and go to school 11 hours a day. Yet that is still creating an equilibrium. It is a day to day or week to week routine that they keep relatively constant. People create a balance in their life that works to maintain whatever goals they have. Lets try another word based example of an equilibrium. You and your employer maintain an equilibrium with your hourly wages. You make 10 dollars an hour and your employer makes 20 dollars an hour. As long as the same hourly wages continue you are striking an equilibrium. You are maintaining a constant ratio between your payment and the employer’s payment. An equilibrium is simply a balance to maintain some kind of condition or achieve some kind of goal. Examples: Give the equilibrium constant for the following examples. No matter how fancy the problem sounds always remember that K is nothing more than a ratio. PRACTICE PROBLEMS: Give the equilibrium constant for the problems below. If the concentration of cars in the city is 5 and the concentration of people is 20. What is the ratio or equilibrium constant for the equation below? If the concentration of birds in a forest is 500 and the concentration of trees is 400. What is the ratio or equilibrium constant for the equation below? If the concentration of teacher at a school is 25 and the concentration of students is 125. What is the ratio or equilibrium constant for the equation below? This is one of the most difficult lessons for most students. Make sure you put a lot of effort into this lesson. NOTE: None of the equilibrium constants ( K ) in this lesson are the true equilibrium constants of the formula. This is also the case for the Δ H of chemical equations and the thermodynamics. I made up both the equilibrium constants and the Δ H numbers because I did not want to spend hours searching for them. The fact that I made them up does not make any of my methods for solving these examples incorrect. Just don’t take the number you see here to be absolute truth. All of the numbers are created to guide you through the process of how to solve these problems. If you have trouble in this lesson go back to sections on proportions and ratios, exponents, solving for an unknown, definition and layout of a chemical equation, states of matter in a chemical equation, coefficients, using stoichiometry in conversions, and Molarity. If you have trouble in this lesson go back to sections on definition and layout of a chemical equation, coefficients, using stoichiometry in conversions, and Molarity. HOW DO WE CALCULATE Δ G (Second Way)? Δ G is in the units Joules (J). Δ H is in the units of Joules (J). T is in the units of Kelvin (K). Δ S is in the units of Joules per Kelvin (J / K). However, again because all of these are linked to chemistry and because chemistry likes to measure everything per mole all of the variables above but temperature may also have attached to them per mole ( /mol). So for example Δ H might be in the units of (J / mol) or (kJ / mol). I will do a demonstration of the two most common ways you will see the units of these problems on homework or tests. VIDEO Calculate Δ G (DELTA G) Demonstrated Example 3: For a particular chemical reaction the Δ H is -1345 J the temperature is 300K and the Δ S is 50 J/K. What is the Gibbs free energy? Is this reaction spontaneous or non-spontaneous? Answer: Δ G = ? VIDEO Calculate Δ G (DELTA G) Demonstrated Example 4: A chemical reaction has the Δ H of 65 kJ/mol the temperature of -100 C and the Δ S of 14 J/mol K. What is the Gibbs free energy? Is this reaction spontaneous or non-spontaneous? VIDEO Calculate Δ G (DELTA G) Demonstrated Example 5: A chemical reaction has a Δ H of 3800 J and a Δ S of 26 J/K. At what temperature does the reaction become spontaneous? Answer: Subtract 3800 J from both sides (red). Cross out the 3800 J on the right side. Remove the negative from both sides of the equation. Divide both sides by 26 J / K (red). Cross out the 26 J / K on the right side. PRACTICE PROBLEMS: Calculate the Δ G, Δ H, Δ S, or T for the problems below. A chemical reaction has the Δ H of +5055 J at the temperature 273K and the Δ S is 105 J/K. What is the Gibbs free energy? Is this reaction spontaneous or non-spontaneous? If you have a reaction with a Δ S of 48 J/K the temperature of 40 C and the Δ G of 12 kJ. What is the Enthalpy of the reaction? A chemical reaction has a Δ H of 14000 J and a Δ S of 44 J/K . At what temperature does the reaction become spontaneous? If you have a reaction with a temperature of 58 C and the Δ H of -7400 J. What is the entropy when the Δ G is -56 kJ? HOW DO WE CALCULATE Δ G (First Way)? What is the energy of the molecules of the products? Do any of the molecules in the products have any coefficients? What is the energy of the molecules of the reactants? Do any of the molecules in the reactants have any coefficients? What is the general formula for Δ G? Modify the Δ H equation for this chemical equation. Fill in the numbers for this specific equation. Modify the Δ G equation for this chemical equation. Use the balanced chemical equation below and calculate its Δ G.
What is a spontaneous process or what is spontaneity? Spontaneous has to do with completing a process without any outside help. For purposes of chemistry we will be talking about the chemical reaction (chemical equation) when we talk about the process. So, what is meant by outside help? The best and easiest way to think about outside help, in terms of chemistry, is that outside help is any form of energy put into the process. In other words, if I am cooking an egg I am putting energy into the process of transforming the egg from liquid to solid. This process would not happen without the help of the energy (heat) from the stove. Therefore, it is not a spontaneous process. What is an example of a spontaneous process? Well, if you use hydrogen peroxide (H2O2(l)) to clean your wounds you know that it will spontaneously bubble. The bubbles are oxygen (O2(g)) and it also breaks down into water (H2O(l)). This is a spontaneous process because no energy is required (although energy will help the process move faster). How do we represent spontaneous or spontaneity in chemistry? The symbol for the spontaneous or spontaneity is G. The G comes from the fact that it is called Gibbs Free Energy. It is a very deceiving name so don’t worry about trying to figure out why they call it Gibbs Free Energy. The change in Gibbs Free Energy is represented by Δ G. When Δ G is a negative number the process is spontaneous. When Δ G is a positive number the process is not spontaneous or non-spontaneous. We can demonstrate this by putting the examples we just discussed of the egg and hydrogen peroxide into chemical equations and demonstrating how they may be shown in a chemistry test or book. The above chemical reaction can be said to have a negative Δ G or is spontaneous. All reactions with a negative Δ G are SPONTANEOUS. The above chemical reaction can be said to have a positive Δ G or is non-spontaneous. All reactions with a positive Δ G are NON-SPONTANEOUS. This demonstration also tells us the units of G. They are usually in Joules (J). However, because chemistry likes to account for everything per mole you can also see the units of G as J/mol or kJ/mol. How does Entropy Relate to the Moles of a Chemical Equation? Without looking at an entropy table, are these chemical equations below increasing or decreasing in entropy (Δ S) based on the number of molecules? Example: What is the Δ n (delta n) of the equation below? VIDEO Calculating the DELTA N ( Δn ) Demonstrated Example 1: What is the Δn (delta n) of the equation below? Add together all of the coefficients of the products that involve (aq) or (g) phases. Add together all of the coefficients of the reactants that involve aq or g phases. Take the sum of the products minus the sum of the reactants. PRACTICE PROBLEMS: solve for the Δ n (delta n) in each problem. What is the Δ n of the equation below? Without looking at an entropy table, are these chemical equations below increasing or decreasing in entropy (Δ S). based on their state? It is one of the most confusing scientific terms, but it is also one of the concepts that people are most familiar with. Entropy is the measure of disorder. As time goes on the entropy of all things will increase. All things will become more disorderly. Something with more entropy (more disorderly) has a higher value (number) associated with it. Something with less entropy (more orderly) has a lower value (number) associated with it. The easiest example to think of how entropy works is a measure of disorder of your bedroom from Monday to Friday. On Monday all your clothes are neatly folded in your dresser or hanging in your closet (very orderly). By Friday cloths are on your floor, on your bed, and all over (very disorderly). So as time passes a bedroom moves from low entropy (orderly) to high entropy (disorderly). The same thing happens to all chemicals. Paint starts to become flaky and break off over time. Tires deflate over time. These are all examples of how entropy affects our daily lives. We can also think about how entropy affects very small things like molecules. Entropy causes larger molecules to break down into smaller molecules over time. The symbol for the change in entropy is Δ S.
What is the relationship between entropy and energy? This is one of the most fundamental and misunderstood concepts in science today and is one of the arguments that come up between religious believers and non-religious believers. If you want to know more about these arguments then I suggest you use this link for an expanded explanation after you read the rest of this section. As you put energy into anything (including a molecule) you can decrease its entropy. This allows you to make a bigger molecule or a bigger anything. Just like taking multiple eggs and scrabbling them together and then cooking them. The energy from the cooking process fuses them together into a larger mass and decreases the entropy of the egg. We can also think about the bedroom analogy that we were discussing about before. From Monday to Friday the entropy of the bedroom increases (becomes more messy) but over the weekend what happens to the bedroom? The bedroom gets cleaned by a person putting energy into it. The energy is expended by the person when they lift the clothes up from the floor or bed and fold them into the closet or dresser. How can entropy be asked about or displayed in chemistry? The first way is to think about each molecule as having a specific entropy and looking up the value (number) associated that molecule on an entropy table. This will later be important to do in the next section spontaneous. The second way is to look at the different states of matter between the products and reactants of a chemical equation. Entropy increases as we go from solid —> liquid —-> aqueous —> gas. In other words, solid has the lowest entropy and gas had the highest entropy. Lets look at some examples below. The third way is to look at the relative entropy between the reactants and the products of a chemical equation. You do this by counting up the moles of the products versus the moles of the reactants. If the products have more moles than the reactants the entropy increased as the chemical reaction proceeds. If the reactants had more moles than the products the entropy decreased as the chemical reaction proceeds. Lets look at some examples below. What happens when you are asked to access the state and the number of moles in an equation in terms of increasing or decreasing entropy? In almost all cases, the state of the chemicals is more important than the number of moles. The reason for this is when you change states you go through very dramatic changes in volume (the amount of space you take up). The spacing of the chemicals in total is the primary way to measure entropy, so you should analyze the state change in a chemical equation and then analyze the amount of moles if there is no state change.